Launching the Open Consultation on the European Open Science Cloud Rules of Participation and FAIR Data Action Plan clearly signalled the vision of the European Commission for the EOSC to be as less Brussels-centric as possible. However, it also brought about a lot of questions. What will happen after the consultation is closed? Who decides what goes in the Rules of Participation in the end? Where can I find a compilation or analysis of the results of the consultation after it ends? These are some of the questions we will answer today. Help spread the word. Click to tweet this now! 1. What happens after August 5, when the consultation will be closed? Both the discussion responses from the Rules of Participation as well as the replies to the recommendations will be addressed by the EOSC High-Level Expert Group (HLEG) – for considerations in the final HLEG report to be published in Q4 2018. 2. In what ways can I provide input to the consultation? You may decide to provide your insights or input on criteria for the Rules of Participation of the EOSC in your specific area of expertise and introduce value add to that topic of discussion and state why it is important. 3. In the end, who gets to decide what goes in the final Rules of Participation? The final say will be decided upon by the members of the Executive Board in collaboration with EOSC board interfaces (which includes the European Commission and the Member States). 4. Can we provide input as an organisation instead of as an individual? Both are possible – if you are part of the coalition of doers it would be useful to monitor this for statistical purposes. 5. Why are anonymous contributions allowed in the Open Consultation? Some individuals may not wish to disclose their personal details, and the system respects that choice. 6. Will anonymous contributions be valued any less than publicly-owned contributions from individuals or organisations? No. If the content is valid it will indeed be considered. 7. Once the Rules of Participation is done, can these rules be contested or can changes be proposed? 8. Will I be able to see the compiled results of the Open Consultation after it's closed? The EOSC HLEG, together with EOSCPilot.eu project may choose to make the compiled results public in a report generated from the platform. Got any more questions? Then don't hesitate to reach out to us directly. Contact us now or you can start shaping the EOSC right now by contributing your thoughts in our Open Consultation. 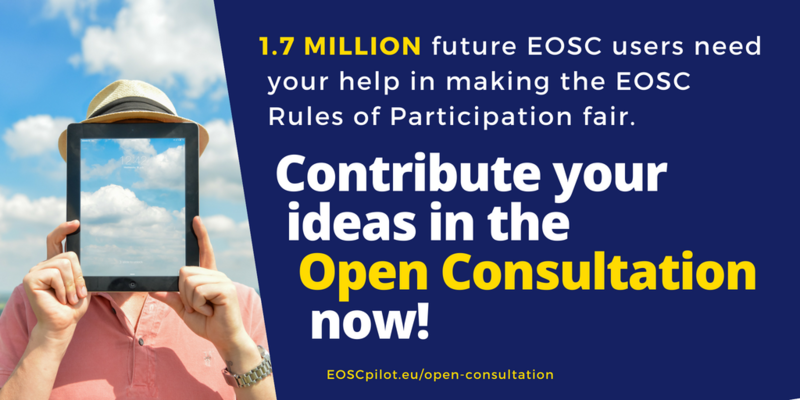 Visit the EOSC Open Consultation Platform now!